Since its publication in 1977, Leslie Marmon Silko's Ceremony has become one of the most frequently assigned and important literary works in the expanded canon. It has garnered praise and respect both as a masterpiece of American fiction and for its contributions to the growing field of Native American literature. This casebook helps readers appreciate the work for both its literary merit and for its exploration of important cultural and historical themes and topics. The initial chapter offers a fresh literary analysis of the novel, with discussion of character and thematic development. Four topical chapters interweave essays with primary documents that situate the work within historical contexts and ongoing contemporary issues. Chapter 2 takes the reader to the heart of the Laguna Pueblo with historical accounts, including a chronology and excerpts from several treaties dating back to 1848, and cultural perspectives based on epics and legends, daily life sketches, and traditional arts and crafts. Other historical context chapters explore the impact of World War II- particularly the development of the atomic bomb-and traditional Native American spiritual and healing practices. The final chapter of this casebook takes a close look at issues of social welfare and problems of alcohol in both historical and contemporary contexts. Western views of medicine are juxtaposed and compared to traditional Native American attitudes and practices. 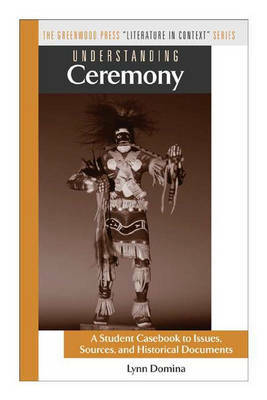 Each chapter in this casebook relates an important thematic topic from Ceremony to its broader social and cultural concerns. Readers are invited to move beyond the text to consider the different perspectives offered by various experts and by people who directly experienced the developments described. Essays help make the connection between the text and the documents that offer these firsthand and historical experiences. Teachers will find numerous ways to incoporate these materials in the classroom for discussions and assignments. Suggested topics and questions are provided with each chapter for educational applications. Further suggested readings enhance this work as a research and learning tool.